I wrote a few posts over the past month or so about riding in cars with sisters. Today, I will not be writing about sisters. My sisters are employed full-time and have busy lives with husbands and children. They are far too busy for road trips with me. One just got back from a trip to the Promised Land, i.e. Texas. That’s the term that we in Louisiana use when referring to Texas. Instead of my sisters, I am traveling the highways with my German Shepherd. He’s old. He’s cranky. He’s loud. When we’re in the car, he often hangs his head out of the window, tongue wagging and ears flapping in the breeze. Since he’s cranky, he’s inclined to do more than enjoy the sunshine. He barks. He barks unusually loud. People’s reflexes are good in Louisiana, by and large, as I see old people jump up several feet and lunge for safety when Bubu lets out a bark. When I reach 55 miles per hour in the Hyundai, he pulls his head inside the car. He leans back on his haunches, and we talk. Often, we talk politics and religion – two subjects I try to avoid with humans. Today, we headed towards bayou country. Bubu proffered that he’s uncomfortable with David Vitter, the Republican candidate for governor of Louisiana. My dog surfs cable TV when I’m gone for the day. He’s not liking Vitter’s ads. In fact, my dog is offended. 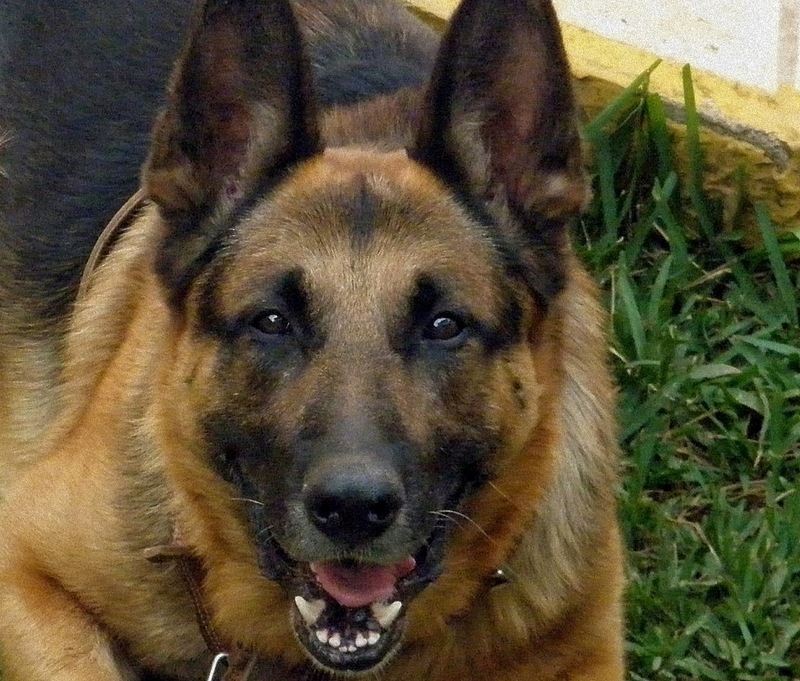 One of the candidate’s ads featured a German Shepherd thanking David Vitter for his work in the Senate to outlaw dog fights. “I can hold my own, ” says Bubu. “I don’t need a US Senator to fight my battles.” I reckon he’s right. I have seen it twice – pit bulls running from the mighty jaws of my 100 pound fur-beast. BuBu believes that dogs and humans should be more authentic. We agreed that humans should act like humans, too, not like, you know, pets. “It’s high time,” I said to BuBu, “that we let go of fear of other humans. Whether the man or woman is Christian, Muslim, Arab or French, we should strive for peace. BuBu read on Facebook today (yes he’s got his own account*) that the Canadians aren’t afraid of Syrian refugees. Canada is moving forward to welcome 25,000 Syrians by the end of the year. Folks, that’s just six weeks away. Well, which is the Promised Land? Where should the Dog and I go for a Christmas holiday? Texas or Canada? *Want to be friends with Bubu on Facebook? Connect here. 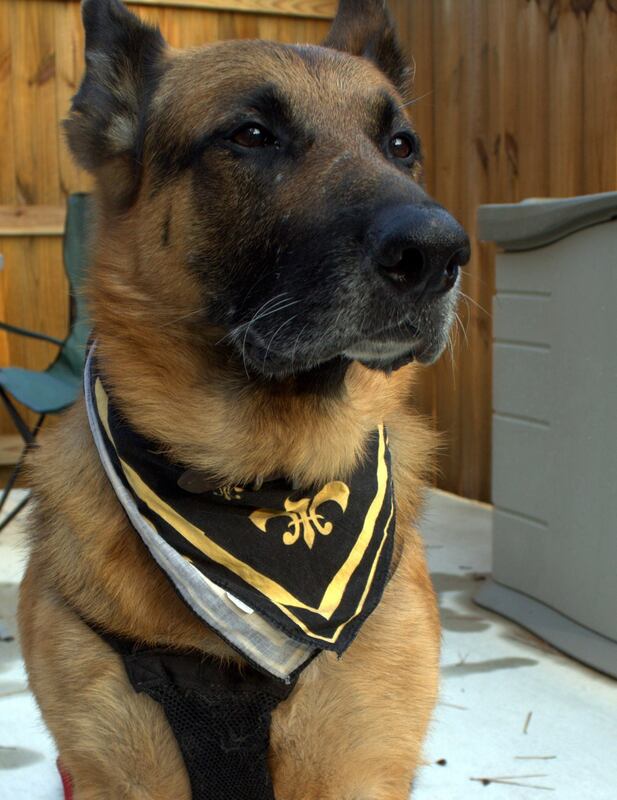 I think Bubu looks very smart in his fleur de lis scarf. As for where you should go for Christmas, just remember that Canada is heading into a very cold time of year, and you likely don’t have enough warm clothing to tolerate it, never mind enjoy it. I once spent a lovely Thanksgiving with friends of a friend in San Marcos, TX, not too far from San Antonio. It’s a charming old town, with a zócalo and some nice old buildings. But it’s a pretty quiet place. Which we’re deserting for Christmas in favor of San Francisco. I couldn’t tolerate Canada in the winter. I do think I could go for San Antonio or quite possibly, the hamlet across the border in Taos, New Mexico. A little snow is good for the soul. Enjoy California. You’re a funny woman. Often misguided, but funny nonetheless. I want to be the mutt’s FB buddy. Currently, I have no FB friends at all, by choice, but I’d be okay with a beast. The beast accepted your friend request. He likes people like you. He said you’re like a good French bread loaf. Crusty on the outside and soft on the inside. He says some crazy stuff, but on this one, I must agree. The refugee issue has left me very sad. The Clinton/Sanders head-in-the-sand approach to security to pander to their voters was bad enough. Then the entire Republican field turns every homeless Syrian into an undercover ISIS agent. I would like to believe at least one of them would have relied upon the Christian virtue of welcoming the alien — just as we welcome orphans and widows. If they would start there, they could then take many alternative courses. As it is, they all — in both parties — merely sound hard-hearted. I may write an essay on this when I am feeling a bit better. Often the Christian viewpoint is not in sync with this world’s views. I believe it will be less and less in the coming years. The general cry from so many directions to scapegoat the Syrian refugee is reprehensible. Once again, a FAB post! Your furry BFF is a very smart pup! Keep up the great essays! Thanks Dan. I will do my best to write more fab stuff. I agree that dogs are perceptive. The candidate that my dog didn’t like lost in a landslide! Smart dog.